10/06/15 - Currently no job openings at The Child Day Schools in Pleasanton, CA. 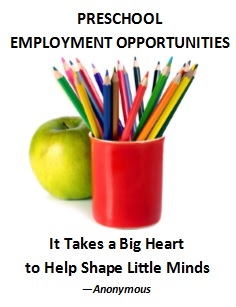 FULL-TIME TEACHING POSITIONS IN PLEASANTON: We have immediate openings for fully qualified early childhood educators with the ability to provide for the emotional and physical needs of early learners, who are committed to ongoing training, and who exhibit professionalism in communications with children, parents and co-workers. If you are an educator who values developmentally appropriate practices, an integrated curriculum, and quality teacher-child interactions we would like to welcome you to our team. Who are we? At The Child Day Schools (TCDS), we provide the highest quality early childhood education programs for early learners and their families and have done so successfully for over 38 years. In fact, we have been voted the Best Children's Child Care in Alameda County. How do we support our teachers? TCDS is a welcoming, collaborative, professional work place that offers teachers the opportunity to develop their skills through continuous training while receiving a competitive salary, 401(k), medical and dental benefits, 19 paid holidays, sick time pay, an end of year teacher retention bonus, and staff childcare (student scholarships). New to early childhood? We welcome passionate, energetic teachers entering the field who are willing to learn how to implement best practices. Contact Lindsay Clow, Director: e-mail your resume to pleasanton@tcdschools.com when applying for the above positions.